Wi-Fi Watchers Seek Help of American Library Assn. Writing yesterday to Feldman was Diane Hickey, co-founder of the National Assn. for Children and Safe Technology. Children, she says, are unwilling victims of the radiation in classrooms and libraries. Bulletin: Dan Doctoroff, CEO of Sidewalk Labs, which is replacing 7,500 New York City phone booths with wi-fi kiosks, will speak Feb. 10 at 6 p.m. at New York University's Center for Urban Science and Progress, Brooklyn. EMF Safety and other groups say the kiosks emite excessive radiation. A petition has been sent to the New York State Attorney General asking for an injunction against the kiosks. 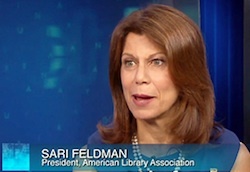 The ALA could be a “frontrunner by acting as a conduit for informing the public of the health hazards and providing library accessibility to those individuals sensitive to microwave radiation," she told Feldman. 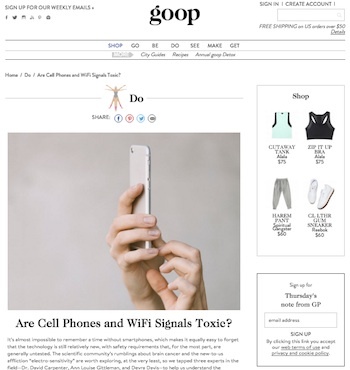 Dr. David Carpenter says, “The strong evidence is that cellphone use results in brain cancer.” The other participants, Devra Davis and Ann Louis Gittleman are convinced that ubiquitous radiation poses dangers, especially to children. Cecelia Doucette, a researcher on hazards of radiation based in Ashland, Mass., said the Ashland Board of Selectmen and Library Trustees approved a grant request for purchasing an Acoustimeter that residents will be able to borrow to measure and remediate Wi-Fi radiation in their homes, offices, schools and places of leisure. The library on Jan. 26 hosted a two-hour program including a film on the dangers of Wi-Fi, cellphone and other radiation. The Acoustimeter measures radiation from cellphones and smart phones, cell towers, digital smart meters measuring electrical use, Wi-Fi networks, wireless video games, digital baby monitors, wireless spy cameras, digital TV broadcasts, audio/visual sender receivers, wireless burglar alarms and cordless phones. Radiation from cordless phones, which transmit continuously, is singled out as particularly strong and dangerous. Cecelia Doucette at meeting Jan. 26 in Ashland, MA. 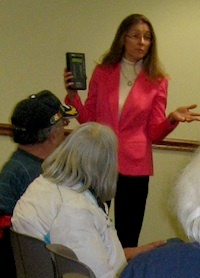 The Acoustimeter she is holding showed red, indicating an excessive level of radiation in the library. Doucette says that eliminating or cutting down on radiation sources in one’s home still leaves the problem of a neighbor with strong radiation-emitting devices. “Comcast/Xfinity has put public hotspots on their routers which throw the signal beyond one’s home so anybody can piggyback off your router from the street, bathing everyone in the vicinity with more Wi-Fi radiation. It slows down your home router," she said. The San Francisco Giants baseball team, which plays in AT&T Stadium, is installing with the help of AT&T 1,700 powerful Wi-Fi devices under seats which will make it the most Wi-Fi wired sports park in the U.S. This will give unsuspecting fans the "hot squat," say critics. Fletcher Cook and Steven Schwadron, AT&T corporate PR contacts, have been emailed questions about the safety of the radiation that will result from the installations but have yet to reply. Wi-Fi equipment in schools, libraries should be replaced with wired equipment. if you are an office worker in cubicle, make sure your head, if against a partition, is not up against the back of a computer; Children under 13 should not put Virtual Reality devices on their heads.